This set of five Cartier Art Deco bracelets were given individually as presents from King George VI, then Duke of York, to his wife, Queen Elizabeth, then Duchess of York and later Queen Mother, for birthdays and Christmases in 1923-25. 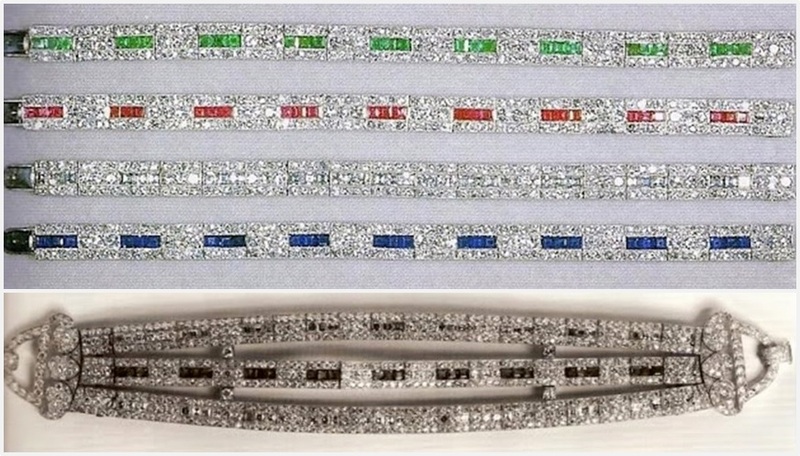 The diamond bracelets have different colored baguette centers: one ruby, one emerald, one sapphire, and two diamonds. There are two diamond bracelets and five total, although only four are pictured above and this set is often referred to as a quartet rather than the quintet that it is. The bracelets are now in the collection of The Queen. 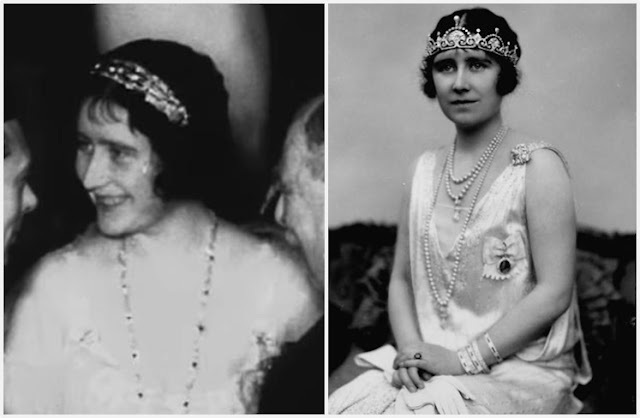 She was spotted wearing the diamond and ruby bracelets as early as the 1970s, so it’s not known for certain when exactly she received them from her mother. She also loaned the ruby bracelet to The Princess of Wales for a tour of Australia in 1983*. The Queen still wears these bracelets. She may get more use out of them for private events, since she has certain sets of jewelry she likes to wear together and most of her tiaras have other preferred bracelets, but that’s my hunch and nothing more. Read more about these bracelets and bandeau at Order of Splendor.